90 S T A R T H E R E 2 0 1 8 exhibit hall. As you learn from these educational opportunities, you will want to take notes and track your ideas so that you can implement them in your everyday business. In addition to notetaking material, cell phones are a great way to document your experience throughout the show as Stuckey suggests. Be sure to ask the exhibitor's permission before taking photos in the exhibit hall and/or classroom. You may want to remember some slides in some of the classes or take pictures of a process or machine to research later. Trade Show Research and Networking Research is an imperative factor in your prepara- tion. Stuckey usually prints out a list of exhibitors she wants to see ahead of time. In addition, most shows provide a directory and online floorplan that details each exhibitor, their booth number, and a brief descrip- tion of who they are and what industry category they serve. That way, you can plan on who you would like to visit without spending too much time reviewing the exhibitors during the show. According to David Gross with Condé, a supplier of sublimation technol- ogy, attendees should do their homework, and consult with other people and understand the reputation of the equipment they are looking at. Going online and reading about the equipment and material that will be displayed at the show may not give you the full picture of what you are looking for. The best way to find out is to use your show time to network with other attendees and the exhibitors. You will find other attendees that are in similar businesses as you and "most of the attendees have pieces of the equipment already and they can give you real-world advice," Todd says. 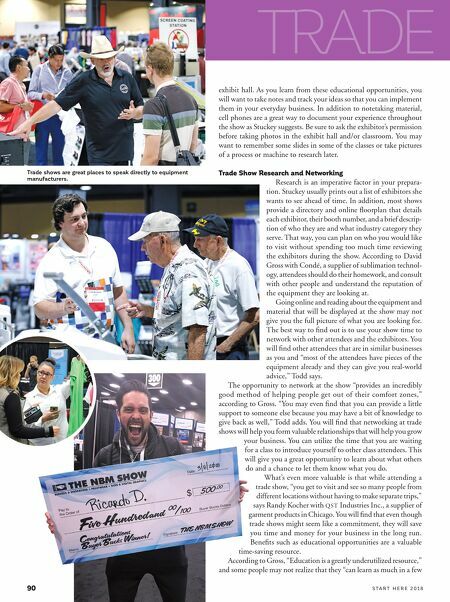 The opportunity to network at the show "provides an incredibly good method of helping people get out of their comfort zones," according to Gross. "You may even find that you can provide a little support to someone else because you may have a bit of knowledge to give back as well," Todd adds. You will find that networking at trade shows will help you form valuable relationships that will help you grow your business. You can utilize the time that you are waiting for a class to introduce yourself to other class attendees. This will give you a great opportunity to learn about what others do and a chance to let them know what you do. What's even more valuable is that while attending a trade show, "you get to visit and see so many people from different locations without having to make separate trips," says Randy Kocher with QST Industries Inc., a supplier of garment products in Chicago. You will find that even though trade shows might seem like a commitment, they will save you time and money for your business in the long run. Benefits such as educational opportunities are a valuable time-saving resource. According to Gross, "Education is a greatly underutilized resource," and some people may not realize that they "can learn as much in a few TRADE Trade shows are great places to speak directly to equipment manufacturers.